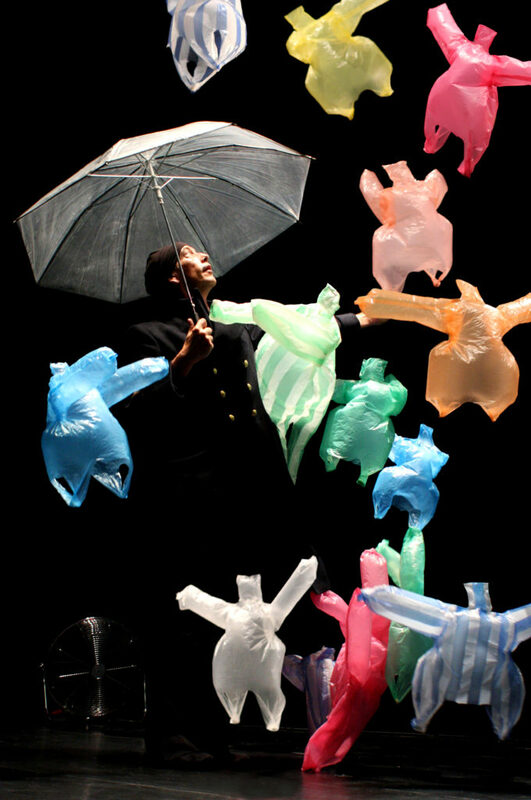 ChiPuppetFest (Chicago Shakes): Plastic Covered Whimsy! In partnership with the Chicago International Puppet Theater Festival, Chicago Shakespeare Theater presents COMPAGNIE NON NOVA’S L’APRE’S-MIDI D’UN FOEHN VERSION 1. The Yard at Chicago Shakes has been converted into an onstage theatre in the round. The limited seating encircles mechanical fans positioned along a circle. The audience enters the theatre together. Jean-Louis Ouvard is inside the circle of fans walking the parameter. Two pink plastic bags are laying on the ground. After the audience settles onto their chairs, Ouvard kneels to the floor to methodically cut and tape together the plastic bags. He then turns on the fans and the bag takes the stage. As a stream of air hits the bag, it floats up and dances. It’s mesmerizing. The bag takes on a persona. ‘She’ unexpectedly glides here and there. ‘Her’ performance is a light and breezy artistic expression. From his seat and with the aid of an additional fan, Ouvard cues three additional dancers to join the spectacle. Each twirls its way onto the aerial stage. Instead of synchronized choreography, the dance is free style. Each dancer moves with spontaneity. Later, Ouvard joins the dancers onstage plucking new chorus members from his pockets. The newbies are different sizes and some even have stripes. The collective is swirling enchantment. 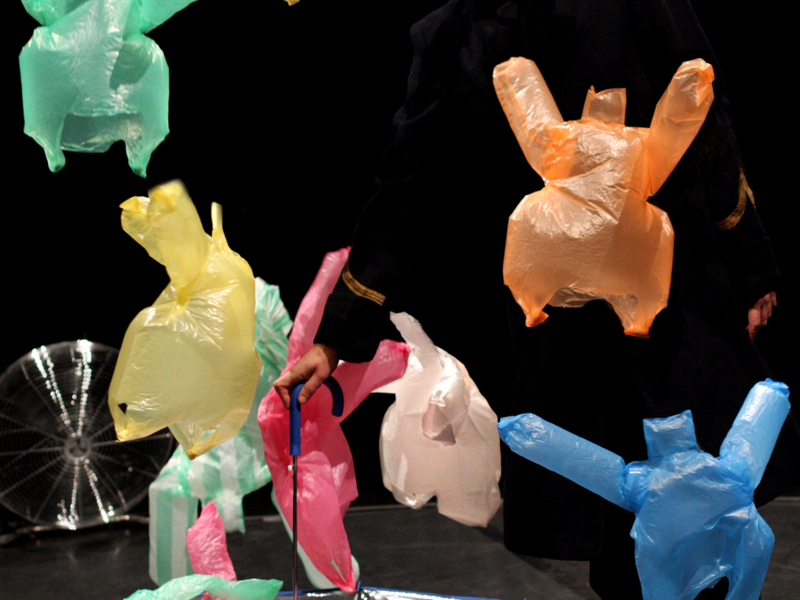 A series of colorful plastic bags are the stars of the show. Creators Phia Ménard and Jean-Luc Beaujault make this aerodynamic science experiment whimsical. Watching the dancing plastic is uplighting and freeing. My written description can’t capture the playful feeling conjured up by bags coming to life. It has to be seen to be believed! I will never look at a plastic bag again without hoping it starts dancing.